Inside your program you can create any number of Courses. Every Course can have an unlimited number of Lessons. If you wish, you can make certain Courses available to only certain groups of students using Roles. Once you publish a Course in your program, all of its published Lessons will be accessible to your students. How can I change my platform styling? You can add your program name or logo, change color schemes and more from your Account Settings page. This page is accessible from the left sidebar on your mentor dashboard, or the the drop down menu at the top right of every page. How do I learn about my students performance? There are a few ways you can measure students performance in your program. 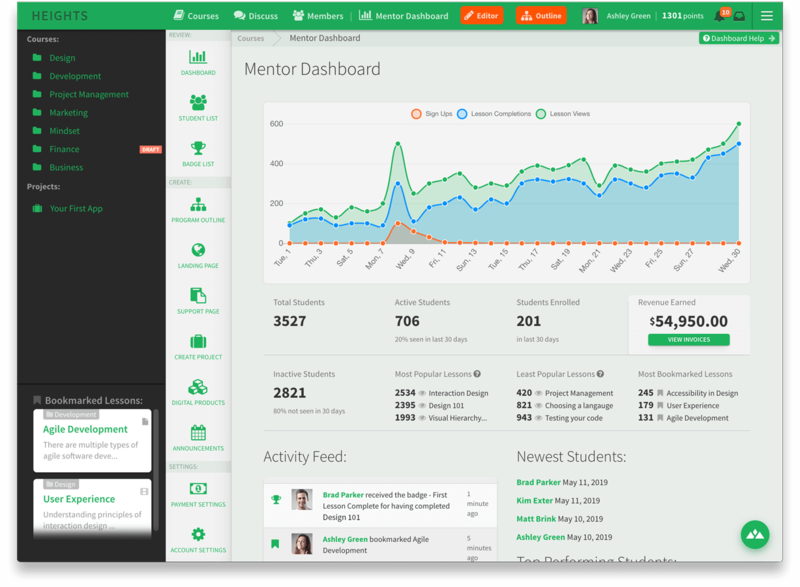 The mentor dashboard provides an overview and has links to the student list and answers views, but the most powerful way to gain insight on individual student performance is via their profile. 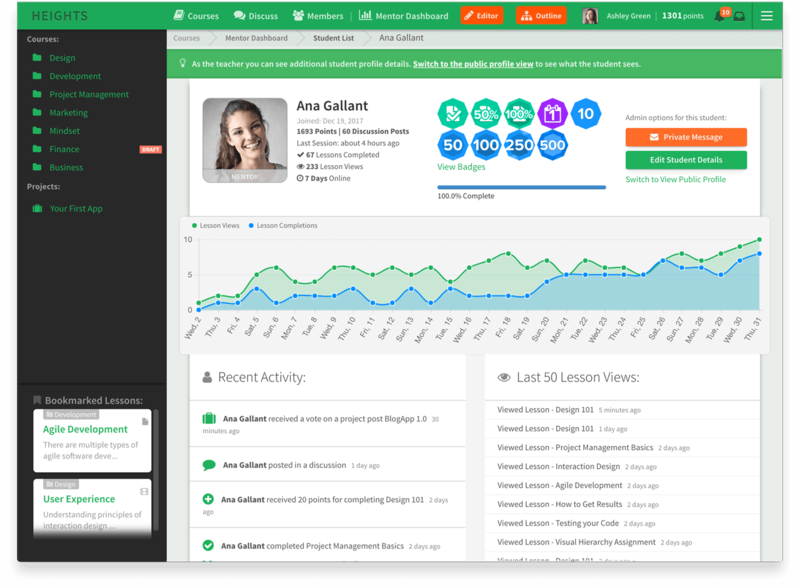 As the mentor you will have access to a more detailed version of the student profile than students see themselves. Here you can see a student's recent lesson views and completions on a line chart as well as which lessons they recently viewed and how much time they have spent online inside your program (displayed under their profile picture). If a student comes to you saying that they are having trouble, or you notice them progressing slower than others, you can compare these metrics and an idea of what a student might need to do in order to progress best. Maybe that means they haven't made it to a certain lesson, haven't spent much time online, or have overlooked particular lesson that they completed too quickly. How many lessons should I have before I start accepting students? How do I know when my program is ready? Every program is different, but as a general guideline we recommend having one to three courses published when designing your program curriculum. Each course should have anywhere from 3 - 50 lessons. Think to yourself, does this seem like enough content for this course, or are there too many lessons that could potentially be separated into a separate course? ie: "Interface Design 101" and "Advanced Interface Design"
How can I tell what my students will see when entering my platform? We designed Heights so that you see what your students see. This way, as you are building your program out, you can feel confident since you are experiencing it the same ways students would be. Students won't be able to see your mentor dashboard, editor, or other admin sections, but lessons and courses will appear the same to them as they do to you. If you would like to get a sense of the student signup experience, you can set your program signup fee to $0 and signup with another email as a "dummy" student account. Then delete this dummy student user before you launch your program. Is there a limit to content I can add? You can create an unlimited amount of Courses and Lessons in your program regardless of the plan you are on. Can I disable points or badges if I don't want them in my program? Yes, in your Account Settings page you can disable these features as well as others if they are not needed for your particular program. Do I need to have a Project for students before launching my program? No, there is no strict requirement for Courses, Lessons or Projects, before your program is ready to go. Everyone will have different content that might benefit from a slightly different structure. We do believe that it is a good idea to find a way to work a Project into your program structure though since this will help students actually put what they learned to use and continue to learn from their peers work as well. You can learn more in the Projects section below, and you can always add a Project later after your program already has some students in it. Your Program is composed of Courses, their Lessons , Discussions, and Projects. Learn about each of these types of content below to understand how they can be combined to make your learning program a success. Your program can have many Courses. A course's name describes the subject of the type of lessons it will contain. For example we might create a course titled "Interface Design". It would then have many Lessons to teach about interface design. When a student purchases access to your program they will have access to all Courses inside it. 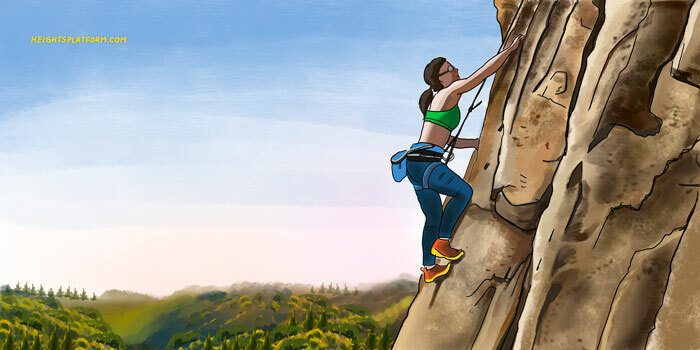 Because Heights is a complete platform, we don't believe it would make sense to sell Courses individually. As you build your program and explore the options available to you, you'll learn that your program encompasses much more than a single Course. This is the default text based lesson type. You can use the lesson editor to adjust and style text inside this type of lesson as well as add image content in between text. The same text/content area is available in all other lesson types as well. If you want to include another type of media in addition to text and images, you will want to use one of the lesson types below. The "Video URL" is simply the link you see in the address bar of your browser when on the desired video page. There is no need to find your video platform's specific embed code. Simply copy the URL of the video on Youtube, Vimeo, Wistia, or almost any other popular platform and paste it in the "Video URL" field. Adding via video URL is a great option if you already have your video content stored somewhere online, if you prefer the video player of a different service, or want the highest quality video playback possible. If you prefer to upload your video files directly to Heights instead of using a third party video service, you can upload a video file from your computer and we will encode it so that it can be played back quickly across every kind of device. After you upload your video, you will need to click "Save Lesson" to save the uploaded data. After you save, we will begin encoding your video for fast playback across devices and geographic locations. If you upload a large video, it may take a few minutes to finish the encoding process. When viewing your lesson if you see a message that your video is still encoding, you can leave the page open, or navigate away to work on other lessons, and your video will appear automatically when encoding is complete. Videos uploaded to your Heights account will be encoded at 720p resolution. 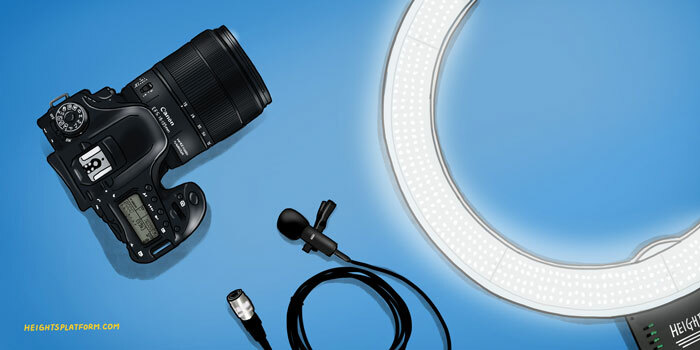 If having a higher resolution video is important to you, you can add videos via the "Video URL" method described above where there is no limit in resolution. Our built in video player will automatically match the color theme set for your account and includes a playback speed option that may be helpful to students who would like to listen to your content either faster or slower. Audio lessons can be played directly from the lesson page using our built in player. Like video lessons, you may use the text area to include a transcript of what is said in the audio. To create an audio lesson, choose the Audio lesson type and upload your MP3 file. If you would like to provide something for your students to download, choose the Download lesson type and paste in the URL of the file you are providing for download. This can be a Dropbox or Google Drive URL, or it can be a link to a file you have hosted somewhere else online. If you would like to collect information from your students, you can use the Assignment lesson type. This lesson type allows you to supply a question at the bottom of your lesson content. Your students will be required to answer this question before they can complete the lesson. As a mentor, you can view the list of all of your student's answers by navigating to the Student Answers page available in the sidebar of your Mentor Dashboard. You can also use Zapier to be notified when a student submits a new answer (See API & Zapier). Can I Include Multiple Types of Lesson Content in a Single Lesson? To create a consistent experience for your students and ensure they know what to expect when navigating your course, a lesson cannot have multiple types other than the ability for all lessons to contain text and images. However, there is one exception to this rule: If you upload an audio file to an Audio lesson and then change the lesson type to Video, your lesson can have an audio player appear simultaneously below the video player. We offer this option incase you would like to have a video lesson with a separate audio track underneath (potentially followed by a transcript added in the lesson text), so that your students can choose how they want to consume your content. To learn about editing your Lessons themselves, see our guide on the Lesson Editor. Projects are a way of showing that students can put the content you've taught them to use in a real world setting. We believe this approach is much more beneficial to both the student and teacher than a traditional quiz or test. It is recommended that you have at least one Project in your Program. What should my Project be for? A Project should be a task where the student demonstrates achieving the goal of your program. 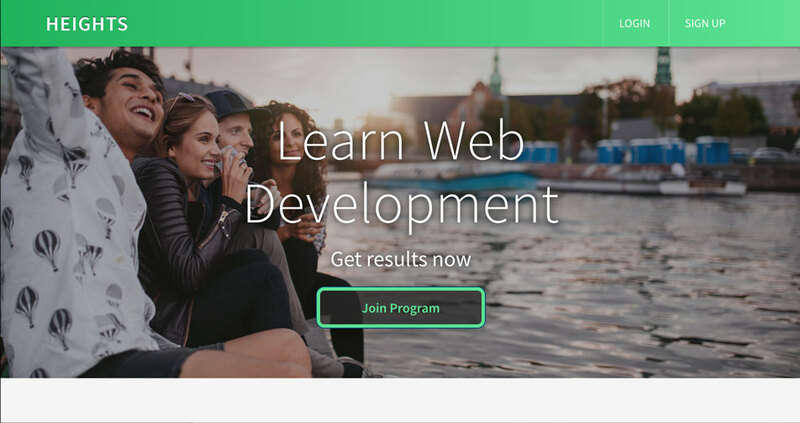 Let's say your program is about teaching people to build their first app. Your Project might then be titled, 'Create your First App', where students would submit their work. Students can submit a Project Post in each project that you create. Since a Project is meant to put knowledge learned in your program to use, a student will not be able to submit a Project Post of their own until they have completed all the Lessons in your Program. 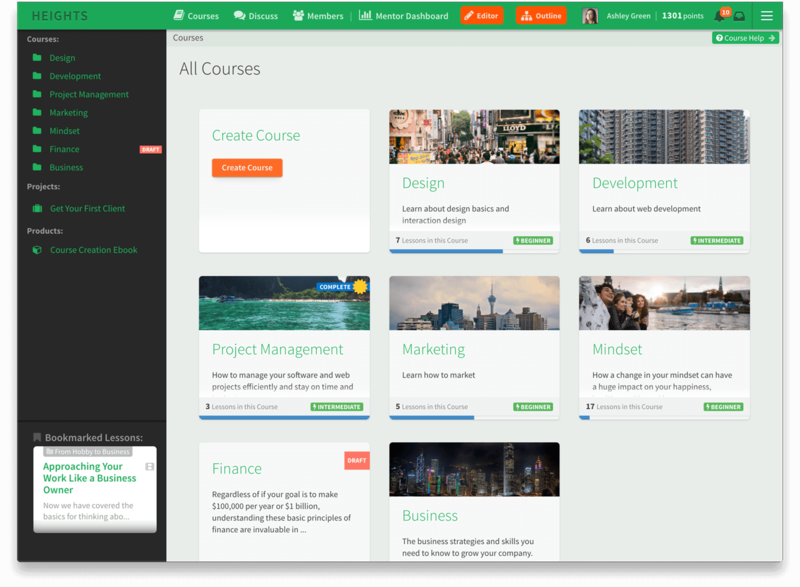 All students are able to view, vote and comment on Project Posts even if they have not yet completed all Courses. When any student or mentor votes up a Project Post, the post will receive 15 points and the student's points will increase by 15 as well. This mechanic helps motivate students to make an impact with their post. As a mentor, you can interact with your student's Project Posts by commenting on them and providing feedback. The ability to comment and vote on new Project Posts gives your program alumni another reason to stick around besides your discussion forums. Before allowing your students to post in a discussion forum it is important to understand a few quick concepts about forums work in Heights. If you have moderated forums on the internet in the past, our system is similar in many ways. 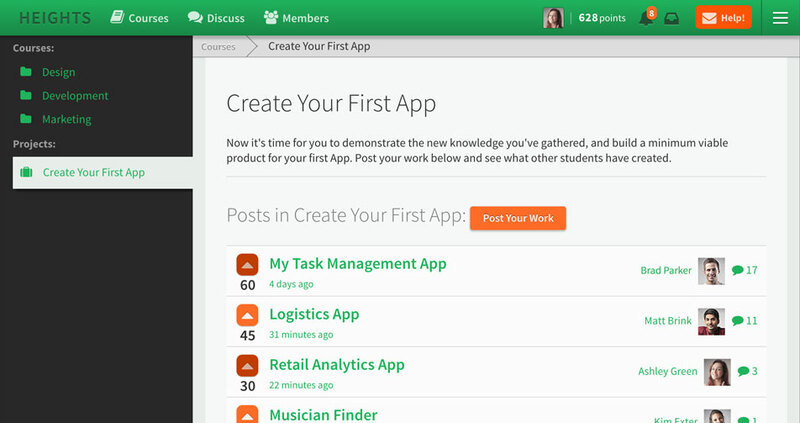 Topics can be stickied to the top of a messageboard, they can be locked to close a discussion and individual posts can be moderated and edited. 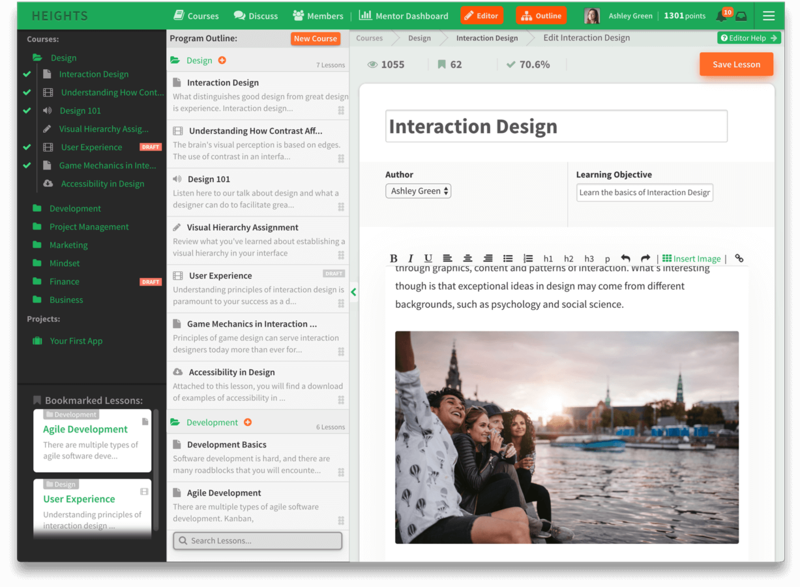 By default, new students are pending moderation, and new posts and topics inherit their moderation state from the student that created it. When you approve a new student's post, all of their later posts will be approved automatically. Additionally, students always see their own posts regardless of the moderation state. For blocked students, this means they might not realize they have been blocked right away. Blocked students cannot send private messages. Should you not have a need for, or wish to launch your program faster without worrying about learning the discussion area, you can disable the discussion area from your Account Settings page. Students won't be able to see your mentor dashboard, editor, or other admin sections, but lessons and courses will appear the same to them as they do to you. View all of your Students in the Student List . As a mentor you can view analytics on student activity and performance by visiting their profile, viewing their answers, their project posts, and their discussion comments. You can allow Student's to enroll in your program for free, or charge them a one time fee to join. A Student account can also be converted to an additional author/admin on our Pro plan or above (See Additional Authors). By default badges and points are enabled in your program. You can choose to give a different amount of points upon completion of each of your lessons. Students can also receive points for votes on their Project Posts. There are two types of badges inside Heights. The first are System Badges. System badges are the default built in badge set that will be automatically granted when the student meets a certain condition inside your platform (ie: completing their first lessson, earning 100 points, etc). The second type of badge is called Custom Badges. 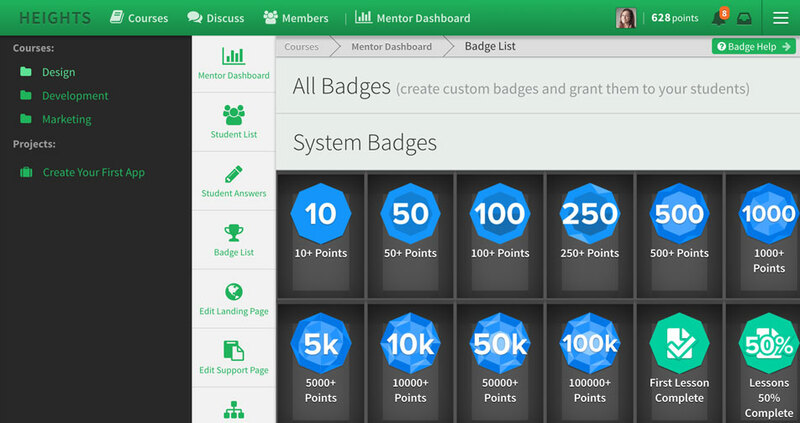 These are badges that you as the mentor can create with your own custom badge imagery. Custom Badges are manually granted to students from the Badge List page, accessible from your Mentor Dashboard. We provide a selection of premade custom badges which you can edit the name and description for, and if you would like to create your own badge image with a similar style, you can download our custom badge template: Download Custom Badge PSD Template . To grant a custom badge to a student, simply click on the badge in your badge list, and on that badge's detail page, select the student to grant the badge to. After granting, your student will receive an achievement notification popup the next time they are online. The sections below will explain how to use the functions and features of Heights Platform to manage your content and your students. As a mentor, whenever you log in to your platform, you will arrive at your Mentor Dashboard. Here you can get an overview of the pulse of your program and students' progress as well as dig deeper into student analytics should you choose. This view also provides links to all areas of the program that you will need to adjust and is not available to any of your students. 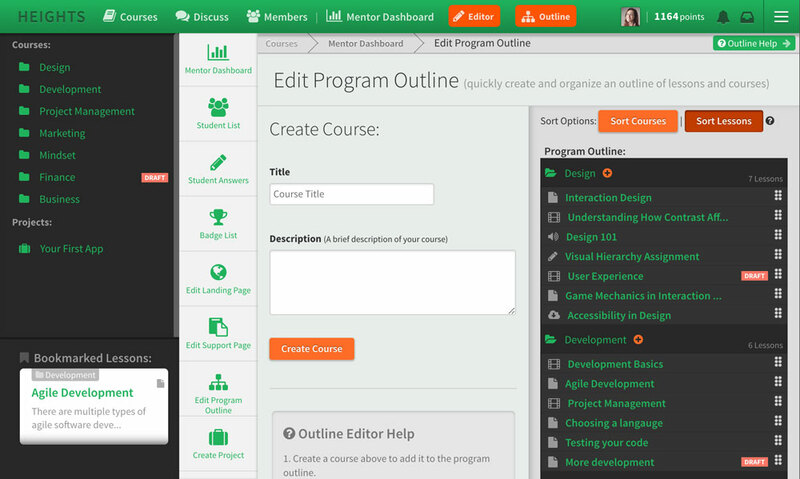 As a mentor, the majority of your time before your program launches will be spent in the Lesson Editor. Here you can create and edit lessons for all of your courses. You can drag and drop lessons in the left side outline to reorder them. When you choose to view your lesson by either clicking the view link at the bottom, or the lesson title in the top breadcrumb, what you see will be exactly what your student sees. When you first create a lesson it will be in draft mode. Remember to select publish and update your lesson to make it live. Students can only see lessons and courses that you have published. At the top of the edit interface you can adjust the lesson title, author display (if you have added additional admins - see Author Help), and learning objective (summary appearing at the top of your Lesson and on Course detail pages). The WYSIWYG (what you see is what you get) text editor allows you to format your content without worrying about learning HTML. You can upload images to display in your lesson by clicking the "Insert Image" link in this formatting bar. Below the lesson text you can choose lesson type, set a number of points for your student to receive upon completing the lesson, and view basic lesson stats (number of views, bookmarks, and percentage who've completed the lesson). By default students can access all lessons in your course and complete them in any order they choose. 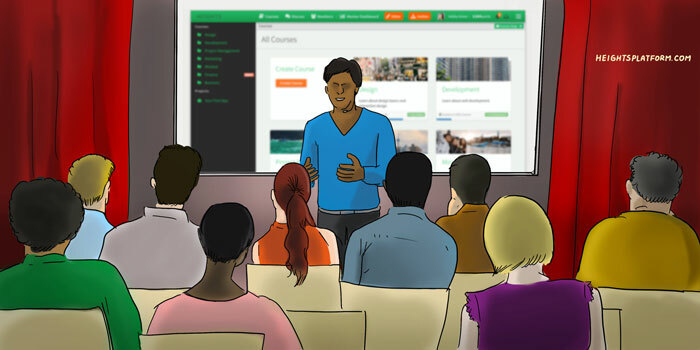 Heights Platform will automatically direct students to the next lesson in the sequence after they complete a lesson, however the student is free to browse another lesson further along in the course by default. If you would like to ensure that your students complete a certain lesson before progressing to another, or to ensure that lessons are completed in order, you can use the "Requires Unlock" option available in the release settings at the bottom of the lesson edit view. Checking "Requires Unlock" will require your student to complete the previous lesson in the sequence before they are able to view or complete the lesson that requires unlock. Checking "requires unlock" on the first lesson in your course will have no effect because there is no lesson before it to complete. Remember you can drag your lessons in the outline to reorder their sequence in your course. In the lesson release settings at the bottom of the lesson edit view, you can also choose to enter a release day for the lesson. This feature allows you to drip feed lesson content to students. For example, if you enter the number 7 as the lesson release day, the lesson will become available to students 7 days after they join your program. You can use this feature to help guide students through your program more slowly and keep fresh new content coming to them based on their individual signup time. To learn more about the different types of Lessons themselves, see our guide on Lessons. When you create a lesson it will first appear in draft mode. Lessons in draft mode are only visible to program admins. Once you have finished adding content to your lesson and are ready for your students to see it, you must select the publish option at the bottom of the lesson edit view. If your course containing the lesson is in draft mode then even though your lesson is published, students will still not be able to view it because the course is hidden in draft mode. When structuring your program you may have ideas of courses and lessons already set, and whether all of the content is ready or not, it is sometimes easier to quickly layout an outline before committing to an exact program structure. The outline editor will allow you to jumpstart your program creation by allowing you to quickly create courses and their lessons and to reorganize them by dragging and dropping. This way you can quickly create a complete structure for your program without having to fill out all of the content for each individual lesson. You can find a button linking to your Account Settings at the bottom of the sidebar on the left sidebar of your Mentor Dashboard. The Account Settings area will allow you to adjust platform wide feature availability and appearance for your students. If you have signed up for a plan that offers whitelabeling you can adjust the platform logo text or upload a custom image here. You can also change the color theme of your platform or disable certain features like badges or the discussion forum (if you do not want to use them with your students). Your account settings page is also the place where you can find your API key to connect to services like Zapier. Learn more about our API and Zapier Integration below. By default students have access to all courses in your platform. If you would like to limit access to certain courses and separate students into different groups you can create custom student roles. A course can have multiple roles to allow multiple different groups of students to access it. For example you might have an introductory course that applies to all of your students, but then you might have a beginner course and an advanced course where you don't want beginners to see the advanced content and you don't want advanced students to see the beginner content. You can create any number of roles needed to segment your students into groups that work for you. The Roles page is accessible from a link in your Account Settings page if you are on our Academy plan. 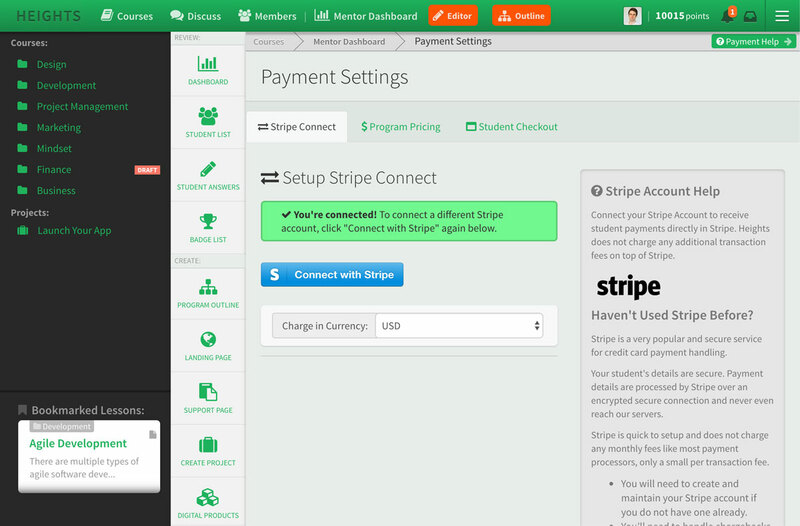 The Payment Settings area is where you can connect your Stripe account to Heights in order to accept payments from your students. We chose to integrate with Stripe for its ease of use for both teachers and students, as well as its security. If you do not have a Stripe account yet, it is very easy to sign up and does not require a complex process like a typical payment gateway and merchant account setup would. If you decide to leave your program free to access, students will be able to create an account and access all of your program without entering billing details. If you set a Program Signup Fee in the payment settings, then immediately after entering their name, email and password, students will be directed to a second step in the signup process that will require them to enter payment details before being able to view your program. NOTE: Ensure that you have your Stripe account connected before setting up your program signup fee. If your program has a signup fee, but is not connected to Stripe, students will not be able to complete enrollment and will see a message that your program is not open for enrollment. When you connect your Stripe account to Heights, any transaction fees charged (Stripe's default is 2.9% + 30¢) are Stripe's alone. 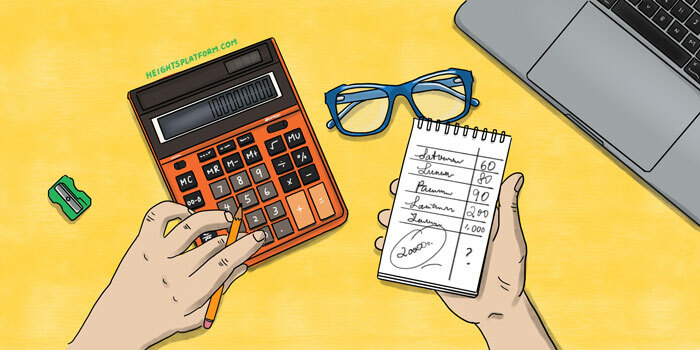 Heights Platform does not charge any additional transaction fees on the payments you collect from your students. You can create Coupon Codes from within your payment settings area to provide discounted or free access to your program. When you want to enroll students for free even though your program has a fee, you can create a Coupon Code with a price of 0 to allow them to signup without being charged. When the Coupon Code's price is set to 0 we will still collect the student's payment information in your Stripe account, but no charge or payment authorization will be made. Inside your Stripe account on https://stripe.com you will be able to see your enrolled students in your "Customers" page. If you need reference to who a specific customer is beyond seeing their email, you can click on them in Stripe and the "Description" text under Details and Account Information will show the customer's name, and the coupon code they used to sign up (if any). You can configure your platform to be located at a domain of your own to brand your platform. This will replace the default yoursubdomain.heightsplatform.com . Your CNAME would point to your subdomain at heightsplatform.com instead of "demo" as shown above. You will likely also want to set a 301 redirect so visitors to the non-www version of your site will be forwarded to the www version or vice-versa. This process will be the same for most popular domain name registrars ie: Google Domains, Namecheap, GoDaddy, etc. 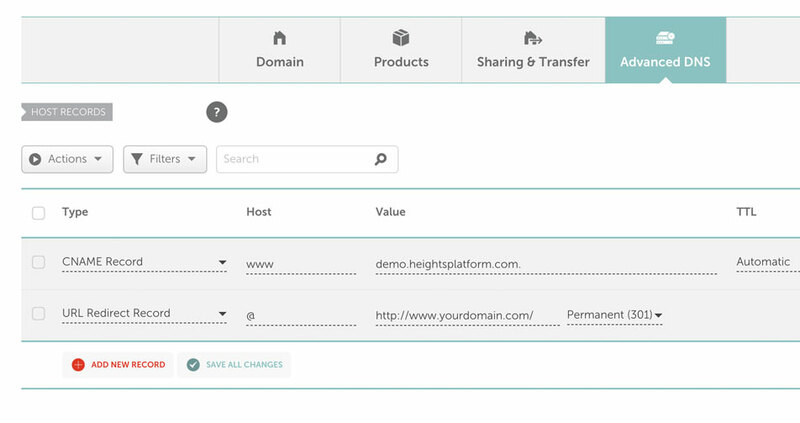 After you have made this change, make sure that you tell your Heights Platform account the domain you would like to use by typing it into the custom domain field of your account settings. It is important to type the domain in the way you want it to display. If you want students to see the www version and type www.yourdomain.com then you should add the www. when inputting your custom domain. Otherwise you can leave it without if you prefer the opposite (yourdomain.com). You will want to setup a permanent 301 redirect for your domain inside your domain account so that students are always directed to the correct version of your domain and can visit your platform. Usually this means redirecting the non-www version to always change to www. This is an important step for any website and if you skip it then students may not be able to access your platform. After adding the CNAME and saving your custom domain in your account settings, try visiting your domain after a few minutes to see if it displays your Heights Platform account. This process usually takes only a few minutes, but it can sometimes take up to 48 hours for DNS changes to propagate across the internet. If you are unsure how to navigate and adjust your domain's DNS settings we recommend contacting your domain registrar's support. They will be able to help you take care of this process. Haven't linked your custom domain to your account yet? Add a custom domain via your Account Settings page. NOTE: Because payment pages require a HTTPS for security, your student billing page will always display on your subdomain at heightsplatform.com rather than your custom domain. If you are a member of our Pro or Academy plan, you have the ability to add authors/admins to your platform besides yourself. To make any student an admin/author, visit either the Student List or a Student's profile page and click on the edit link. On the student edit screen you are able to check them off as an admin/author, a messageboard moderator, or both. Every plan allows an unlimited number of messageboard moderators, but the number of additional authors/admins is based on the plan you have selected. 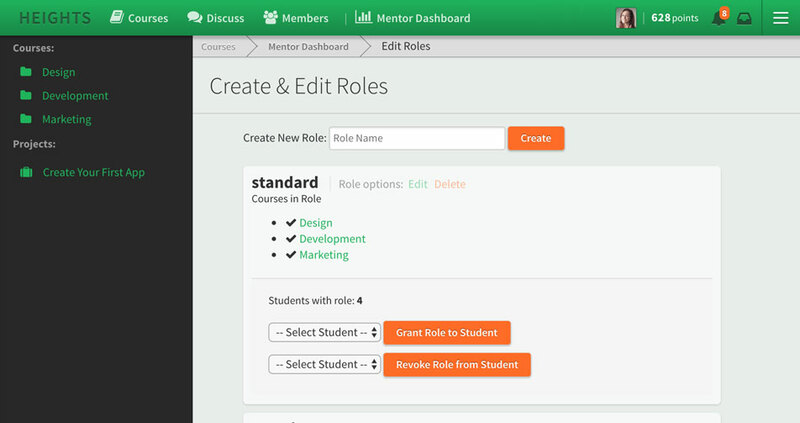 Any other user that is made an admin will have access to your Mentor Dashboard, Lesson Editor and other mentor features. They will not have access to your account settings page, your billing page, student payment settings, and they will not be able remove your admin status. NOTE: Do not make a user an author unless you are comfortable with them having access to student data and being able to modify your program content. It is not possible to restrict an author to only modifying certain parts of your program content. Our landing page editor allows you to create a simple one page website to promote your program. We intentionally keep options for editing your landing page sparse and simple so that you don't need to spend time learning a new system, adjusting HTML, or checking different themes. We want to ensure your time is spent focusing on improving your program for your students rather than tinkering with web page settings. Landing pages have a title, subtitle, background image, main content section, and testimonial section. We also offer support for your connecting to your Google Analytics account to measure visitor analytics, and Facebook Ads tracking (coming soon). The color theme of your landing page will automatically match the color theme that you selected in your account settings for the rest of your program. You can find the link to Edit Your Landing Page on the left sidebar of your Mentor Dashboard. The built in support page allows you to answer student's common questions and help them learn how to find additional support easily. You can adjust your student support page to have any information or links needed. Students can find a link to the support page from the navigation bar menu dropdown in the very top right of every page of your platform. You can find the link to Edit Your Support Page on the left sidebar of your Mentor Dashboard. On the left sidebar of your Mentor Dashboard you can find a link to Create Announcements . An announcement is a notice that will appear for your students at the top of their courses page. You can use announcements to post notice of new courses/lessons that you've added, to link to a live webinar, or to announce details for an in person training or event. Every announcement has a start date and end date. The announcement will only be visible on the courses page during the period between its start and end date. The announcement type option simply displays a different icon for your announcement (Calendar icon for Date/Event, Exclamation icon for Notice, and Star icon for Celebration). You can use Zapier to easily connect Heights Platform to your favorite apps. To do this you will need to create an account with Zapier and then create a new Zap. To connect your Heights Platform account to Zapier you will need to provide your API key. You can find your API key on your Account Settings page. Thank you for using Heights! New content added! Please let us know if you feel a help topic could benefit from further information. Copyright © 2015-2019 Velora Studios, LLC. All rights reserved.